So yesterday i took a Spontaneous trip over the border to Germany to visit Flensborg. This time it was not only for shopping like many danes do, but just to relax and walk around a little. We went there around noon and the city was full of like even though it was Thursday. We found a restaurant/cafe, in the end of the shopping street Großen Strasse, called Cafe Central. It was pretty big and i'm sure it is a place to party in the weekend. All the tables outside were taken so we had to sit inside. The dishes were classic german food but not the best i have had. If i have to eat german food at noon i usually go for fish, because it's not too heavy a dish, but it tasted more like butter it was fried in, than actually fish. I really liked their shopping street and the shopping center Flensburg Galarie. I found one of my favoirte stores called Saturn. It's a huge electronic store with a lot of DVD's, CD's and games. Also i found this really geeky store at Großen Strasse called Gandalph. It was filled with books, merch and mangas! My geeky heart was bleeding because it was all in German and even though i do understand german, i only read books in English or Danish. Near the big church in town there was a litlle flea market. Mostly old people trying to sell old porcelain and vinyls but very charming! One thing i have always loved about Germany is the many Eis-cafés! They have every kind of ice creme you can imagine and i can't understand why it's not a thing in Denmark. When im in Germany in the summer im going to a eis-cafe at least one time every day! 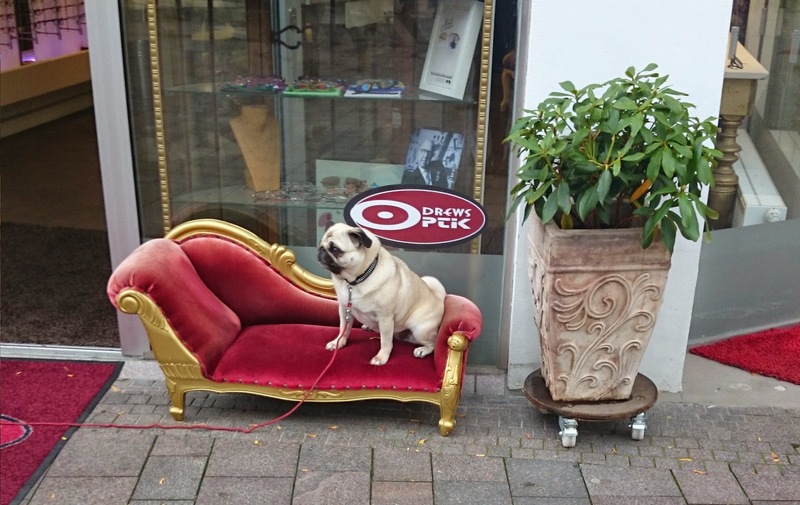 Saw this Charming little pug making good advertising for a glasses store!